While bankers perform a service for investors, they are in competition with other types of advisors who often offer more complex investment services and can sway investors with a promise of a more aggressive investment strategy and greater portfolio growth. Full Service Brokers and Independent Financial Planners are the most popular types of advisors, however, more than 5 percent of affluent investors choose to use their banker or private banker as their primary financial advisor. There are some investors for whom a banker serves as the perfect financial advisor. But there are many investors who currently work primarily with a banker but who perceive they could benefit from advisors with more experience in a variety of areas related to complex investments. According to Spectrem’s recent study Profiling of Investors Based on Their Preferred Advisor Types, Bankers have more Millennial clients than any other type of advisor, and almost twice as many as any other type of advisor. This could be the result of being a young person’s first choice in regards to financial and investment advice. For bankers working with Millennials, it is important to prove that they can help an investor’s portfolio grow as they mature. Bankers often have a higher degree of technological abilities to provide more up-to-date information on mobile technology than many other types of providers, and they must indicate that to their younger clients. On the other hand, advisors who attend or conduct seminars for investors must distinguish themselves from bankers by listing the functions they perform that bankers do not perform, as well as the depth of products they offer that are beyond the scope of offerings made by bankers. It is possible that bankers are working with Millennials who have a great deal of money to invest. According to Spectrem’s report Financial Behaviors and the Investor’s Mindset, among Millionaires with a net worth between $1 million and $5 million, Millennials have a higher net worth than Gen X investors, reaching $2.4 million on average. In the Ultra High Net Worth wealth segment, in which investors have a net worth between $5 million and $25 million, Millennials and Gen X investors have an average net worth above $9 million. Are bankers’ clients receiving the level of information and advice they need in order to improve their portfolio? Bankers need to be able to answer that question for the investor with a resounding “Yes’’ and a list of available products and services that can extend an investor’s portfolio. It is interesting to note that bankers also have a very high percentage of investors over the age of 70, referred to by Spectrem as World War II investors. It is possible these investors have been with the same bank throughout their adult lives. Research indicates banker clients are much more likely to stay with the bank if their personal advisor leaves than go with the advisor to a new company. Many investors prefer stability in their financial decision-making. Banks and bankers historically project an image of stability, and there are investors who like that appearance. Other types of advisors must be ready to prove that stability exists within their firm. Advisors of all types need to prepare a list of clients who have been with the advisor over the long-term, or should indicate the amount of time the advisor has been with his current firm, if they want to appeal to a banker client’s desire for a stable investment relationship. 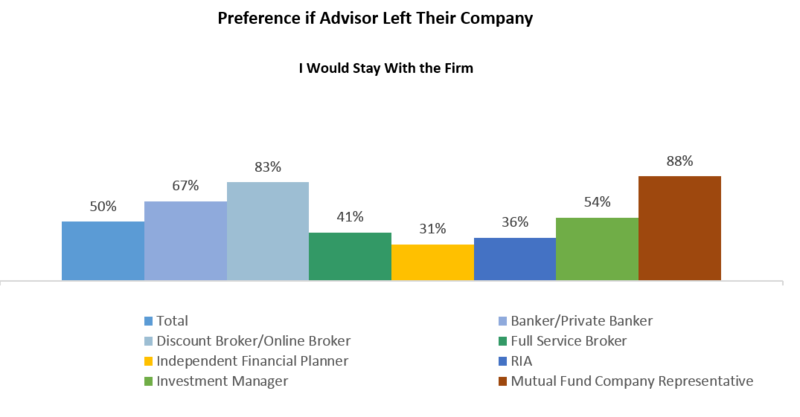 Spectrem’s report on investor profiles shows investors who use bankers tend to more conservative than investors using other types of advisors. Bankers need to make sure their investor’s goals will be met with a highly conservative portfolio. Advisors meeting with potential clients who currently work with a banker need to show just how a slight increase in the level of portfolio risk may increase the likelihood of reaching their financial goals. There are a dozen or more factors that determine the type of advisor an investor is comfortable with. Bankers attract younger and conservative investors. Advisors wanting to attract those types of investors must appeal to those investors with the use of technology for the younger investors and by projecting a conservative investment structure to those investors who are risk-averse. Advisors can benefit from knowing why an investor has chosen to work with them. Bankers need to make certain they are meeting the current needs of long-time clients and must accentuate the investment opportunities that are available through their firm's assets and connections. If an investor works with a banker because he is looking for safety and comfort in his investing relationship, other types of advisors need to show that they can create an investment strategy that more appropriately aligns long-term goals with current portfolio design. They need to indicate they understand the long-term targets of the investor and that they are not about making a quick buck in a volatile market.